Meizu's upcoming flagship smartphone is less than 24 hours away, but we already know quite a bit about the Pro 7 and the more powerful Pro 7 Plus. Despite rumors claiming one of the Meizu Pro 7 variants will be equipped with Samsung's Exynos 8895 chipset, it looks like both devices will come with MediaTek chips inside. 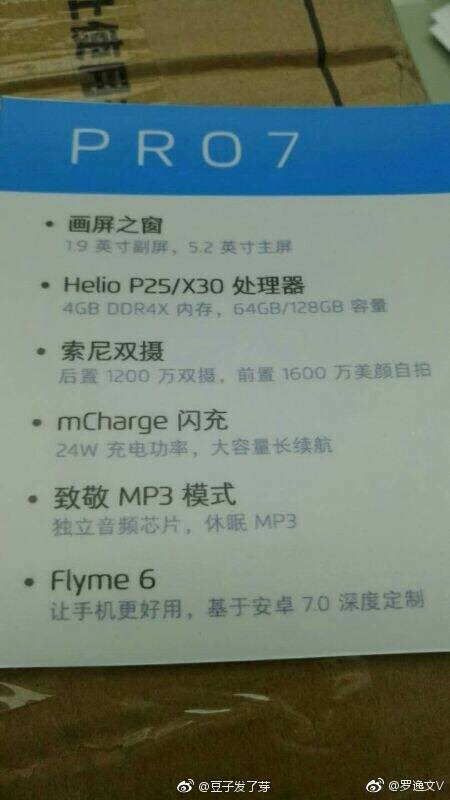 A leaflet listing Meizu Pro 7's specs has just been leaked one day ahead of the phone's official reveal. The information we got from the document comes in line with some of the previous unconfirmed reports. A dual-camera setup will be included on the back side featuring two 12-megapixel cameras with Sony sensors. On the front, a no less impressive 16-megapixel snapper will be available for selfie lovers. We have also learned the Meizu Pro 7 will sport a 5.2-inch display and will feature the company's mCharge fast charging technology. When it comes to software, Meizu is expected to include Flyme 6 OS based on Android 7.0 Nougat on both versions of the Pro 7. Meizu confirmed its flagship smartphones would be revealed on July 26, but they're unlikely to be available outside China, at least at first. The X30 should be powerful, no doubt. But perhaps only in the CPU department. It's GPU won't be a match to today's flagship chipsets. Helio P25 is a midrange soc. They are using it for flagship phone?? How they will compete with Xiaomi mi6?? No chance at all. For the Pro 7 Plus ultimately it's about both batt size and price. If it's anywhere to or even worse exceed say a 1+3T then I bid it "Gtfoh with that...".